This Black Bean Taco Quinoa Skillet is an easy, one pan meal that the whole family will enjoy. Loaded with quinoa, black beans, veggies, and spices, this healthier dish is sure to be a dinnertime favorite! It’s a new year, and a new you. Wouldn’t it be nice if we all got the chance to start over again? To start fresh? Ok, so maybe we don’t need to start fresh with everything, but with those pesky little things…like eating better, exercising more often, focusing more on the little things that count. I know those are just a few things that the new year gives me hope for. I’ve said it before, and I’ll say it again…I’m not one to make resolutions. Instead, I make goals. I usually fail at meeting my end of the bargain when it comes to resolutions. But goals, on the other hand, is almost a for-sure thing for me. I’m very goal-oriented in life, and when I set my mind to something, I usually end up achieving it. And like most people, one of my main goals for 2017 is to eat healthier. I’m not talking about cutting out sugar, carbs or anything crazy (hey, I’m a food blogger and that just won’t work for me!) but introducing more fruits, veggies, and whole grains into my diet. 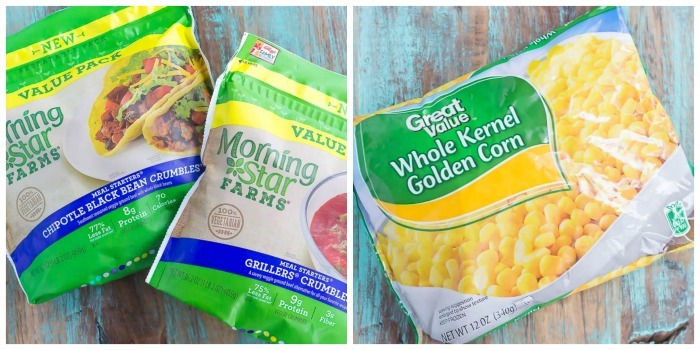 And that’s why MorningStar Farms® Chipotle Black Bean Crumbles™ and MorningStar Farms® Grillers® Crumbles™, along with Great Value™ Whole Kernel Golden Corn from Walmart help me stay on track. MorningStar Farms® products aren’t just for vegetarians, they’re for everyone! And trust me when I say that it’s delicious. The hubster, who is a meat and potatoes kind of guy, loves MorningStar Farms® Crumbles. 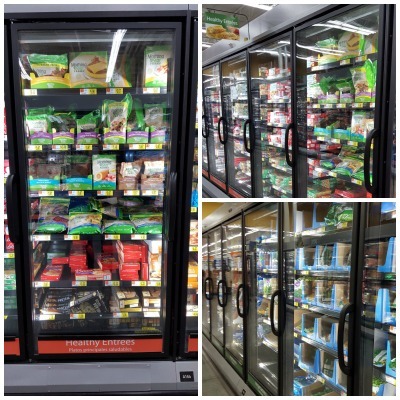 MorningStar Farms® products are great busy weeknights, families, and anyone who is looking for a convenient, “as-is” meal solution. MorningStar Farms® also helps me reach my ‘Vegolutions’ of eating more vegetables. With this delicious and easy meal, I don’t have to worry about not consuming my veggies. If you love MorningStar Farms® products like I do, then here’s a great offer for you! 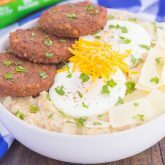 Buy any 3 MorningStar Farms® products, earn $3! This applies to all MorningStar Farms® products at Walmart. This offer begins on January 9th, 2017, and goes through the end of January. Click here to check it out! So now I bet you’re wondering about this Black Bean Taco Quinoa Skillet, right? 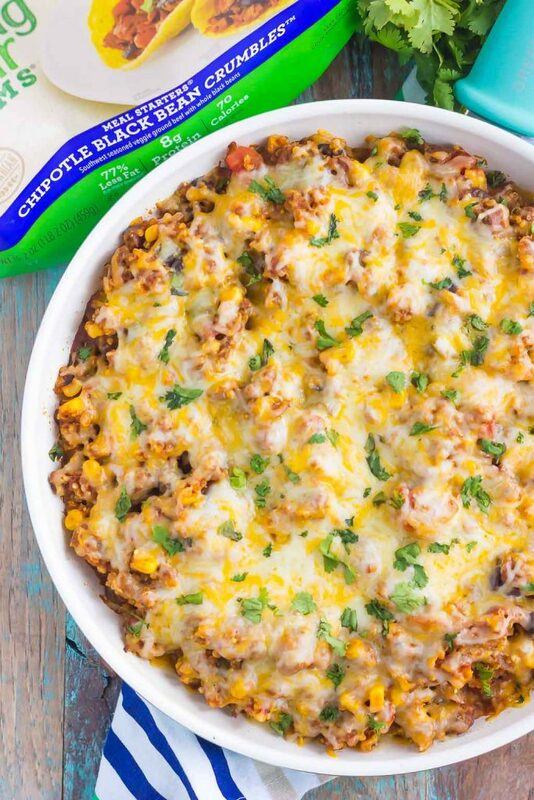 It’s made with MorningStar Farms® Chipotle Black Bean Crumbles™, is healthier, and oh-so good! And like most of my recipes, this dish is a breeze to whip up. But, you knew that was coming, right? 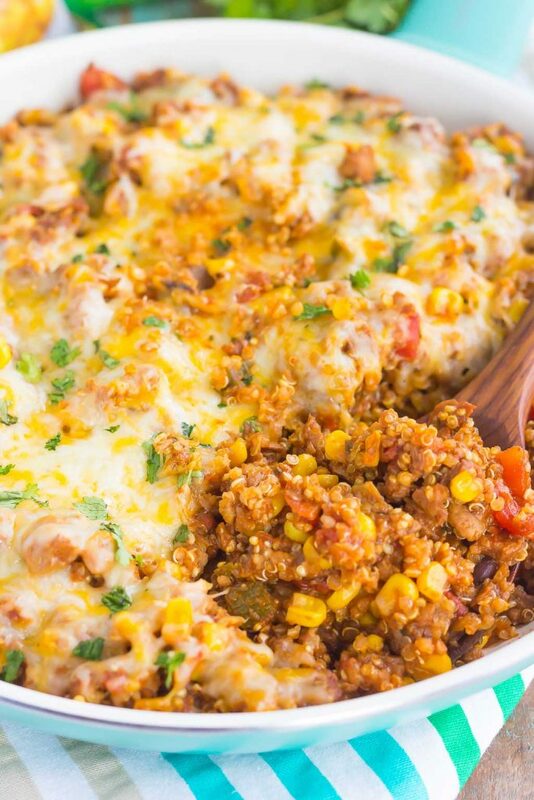 This Black Bean Taco Quinoa Skillet is made in one pan, and one pan only! Yep, even the quinoa gets cooked in the pan, so it’s easy clean-up. And we could all use a little more of that, especially during busy weeknights! Now, let’s talk about the flavors. Mexican steals my heart every time, so this Black Bean Taco Quinoa Skillet is filled with Mexican flavor. From the MorningStar Farms® Chipotle Black Bean Crumbles™ to the spices, veggies, salsa, and quinoa, this skillet has it all. Fresh, fast and bursting with flavor (and cheese, you gotta have some cheese), this dish was made for you. To start, you’ll sautee some onions and minced garlic in a large skillet over medium heat. Then, you’ll add the MorningStar Farms® Chipotle Black Bean Crumbles™, water, taco seasoning, diced tomatoes, salsa, and Great Value™ Whole Kernel Golden Corn. Stir and let the mixture thicken just a little. Then, you’ll add in the quinoa and some more water, cover and cook until the quinoa has absorbed most of the liquid. Top the mixture with some shredded cheese and cilantro, and your one pan skillet is ready to be devoured. Told you it was easy! So grab those ingredients and whip up this easy and oh-so delicious Black Bean Taco Quinoa Skillet. Easy to make and even better to eat, you’ll enjoy the zesty flavors and hearty ingredients! 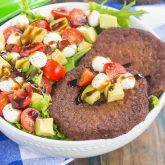 Looking for more easy meal ideas? I’ve got you covered! Add diced onion and saute until soft, about 2-3 minutes. 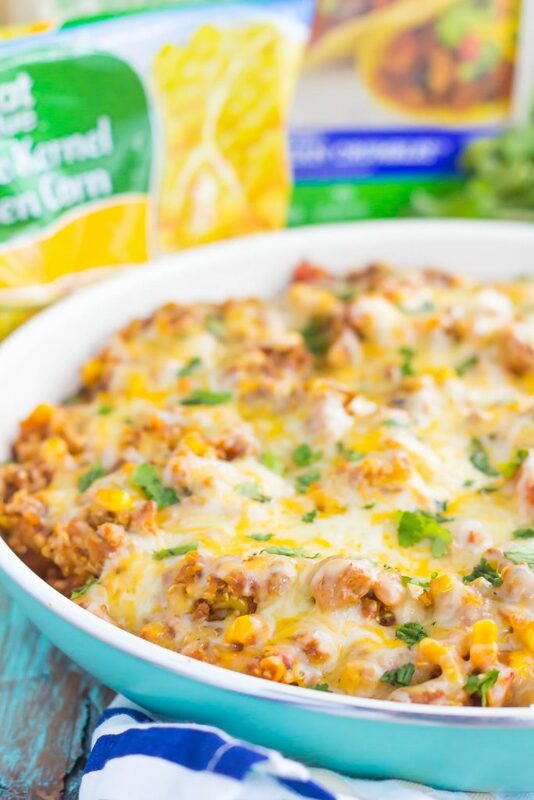 Add minced garlic, MorningStar Farms® Chipotle Black Bean Crumbles™, water, taco seasoning, salt, pepper, diced tomatoes, salsa, and Great Value™ Whole Kernel Golden Corn to skillet. Stir and cook until mixture is slightly thickened, about 5-7 minutes. Add quinoa and water. Stir thoroughly. Bring to a boil and then reduce heat to low, cover, and simmer for 18-20 minutes, or until quinoa has absorbed most of the liquid. Top with shredded cheese, cover, and let stand until cheese has melted. Sprinkle cilantro over cheese, if desired. Like what you see? Then be sure to head to your nearest Walmart to check out their selection of MorningStar Farms® and Great Value™ products! Be sure to follow MorningStar Farms® on Facebook, Twitter, Instagram, and Pinterest! Thanks, Megan! It's a delicious and easy meal! I can't imagine fully cutting out sugar or carbs even if I wasn't a food blogger, lol. I need those in my life ;) Everything in moderation, right :) ? I haven't seen this brand around here, but this looks delicious! And who doesn't love a good for you dish that tastes yummy? I would be all over this for dinner and I bet it would even be delicious for breakfast with an egg! Next time I'm at the grocery store, I'll have a look out for this. Pinned, of course. Happy Monday!! Haha yes! Everything in moderation is definitely my motto. I love your idea of making this with an egg, sounds perfect! Thanks for the kind words and pin, Dawn! Thank you, Sarah! It is just a bit healthier and so delicious! Awesome idea! I love Morning Star Farms sausage links, so I bet I'd love the black bean crumbles, too. This looks delicious, Gayle! Quinioa has definitely become a staple in our house recently. Even the kids love it! Thank you, Blair! I am hooked on quinoa and MorningStar Farms. I will have to try their sausage links! I predict this is going to be a very popular recipe! I love everything this dish includes! Pinned! I'm definitely with you on the goals vs. resolutions for the New Year, Gayle! Goals just seem more realistic and obtainable, right? My next goal is going to be to eat this quinoa skillet on repeat! ;) LOVE this, girlfriend! The flavors are spectacular and I love that its healthy! This is how I want to eat in 2017! Pinned of course! Cheers! Yes! Goals are definitely more obtainable, at least for me. And I love your new goal! :) Thanks for the kind words and pin, friend! Thanks, Demeter! Hooray for being goal-oriented! :) Happy New Year to you too and thanks for the sweet comment! Interesting recipe Gayle! I love the flavors here! Here's to better eating in 2017! Quinoa is something I just don't make enough! This sounds so easy (and yes -- totally a great way to get those extra veg in!). Thanks, Ashley! Easy meals are the best! Adding more fruit and veggies is an awesome goal! 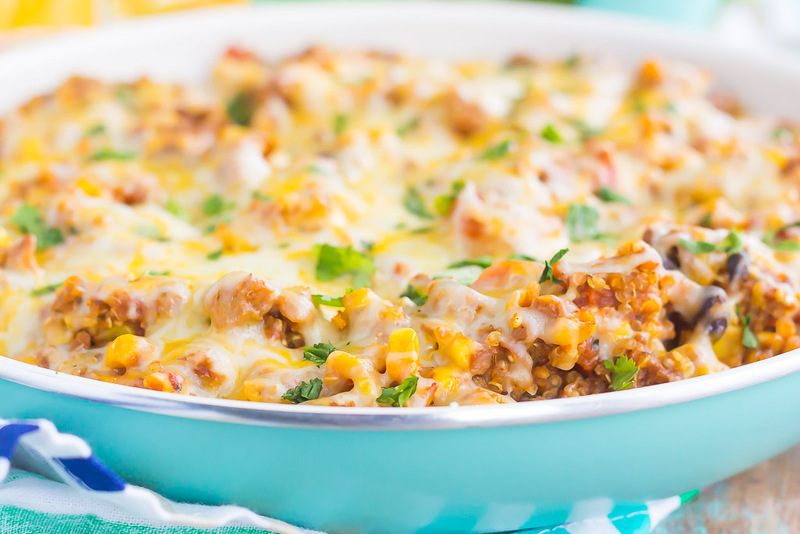 This comforting skillet meal is such a great place to start! Love how easy and loaded with goodies it is and so perfect for busy weeknights! I'm trying to be more goal-oriented this year, I definitely need to be more like you haha! This skillet meal looks so easy and I love the quinoa and black bean crumbles in there too! Thanks, Danielle! One pan meals are my favorite! I love this! I'm not usually one for resolutions either. They just don't work for me. Instead, I might start doing one small thing different each day/each meal and eventually it does add up! Definitely need to add this to my meal plan this week! That's a good plan to have, Shelby! I like your thinking! :) Thanks for the kind words! What a great idea using it in a recipe. I used their products but not usually this way. This skillet looks amazing!! Thanks for the sweet comment, Zainab! MorningStar Farms has so many different uses! I was just thinking that I need to make a skillet quinoa -- I'm craving it so much right now! This truly isn't helping, because Mexican quinoa is the best! I've never seen those black bean crumbles -- I will have to check those out. This looks so cheesy and delicious! 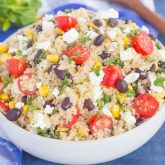 Mexican quinoa really is the best, I'm hooked! Thanks for the kind words, Marcie! Yum! This skillet looks fantastic, Gayle. I have a feeling my quinoa-hating husband would gobble this up... especially because it's taco-flavored and has cheese! I agree on the whole goals vs. resolutions. I like to set small goals throughout the year, which makes it so much easier for me to achieve them! I think we can all agree that eating more veggies and whole grains is super easy with a skillet like this one! Haha my husband doesn't like quinoa either, but he did like this because of the taco flavors! :) Thanks so much for the sweet comment, friend! I love anything Morningstar makes with black beans in it so I can't wait to try their crumbles! By the way this taco skillet is made of dreams, I love it! I'm not one for resolutions either. I do resolve to try this black bean taco dish because it looks delicious and you can't go wrong with a skillet meal! Thanks for the skillet love, Rachelle! Three cheers for quinoa skillets!! Great minds think alike right?? :) This sounds deelicious! I can't get enough of easy & healthy meals right now! Thanks for the sweet comment, Ashley! OH my gosh I have so many points haha. Again, I totally love your make goals not resolutions thing because well that's the ultimate *goal* anyway right? Two, I LOVE MorningStar. Being vegetarian they've honestly saved my dinner SO many times. 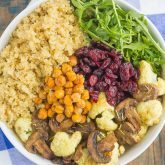 These skillet is an absolute beauty - love how healthy and easy it is Gayle!! Thanks, Jessica! Yes...goals sound so much better than resolutions! And thank you for the skillet love! This looks sooooo good! Can I get away with a can of black beans instead of using the crumbles? Hi Becky! 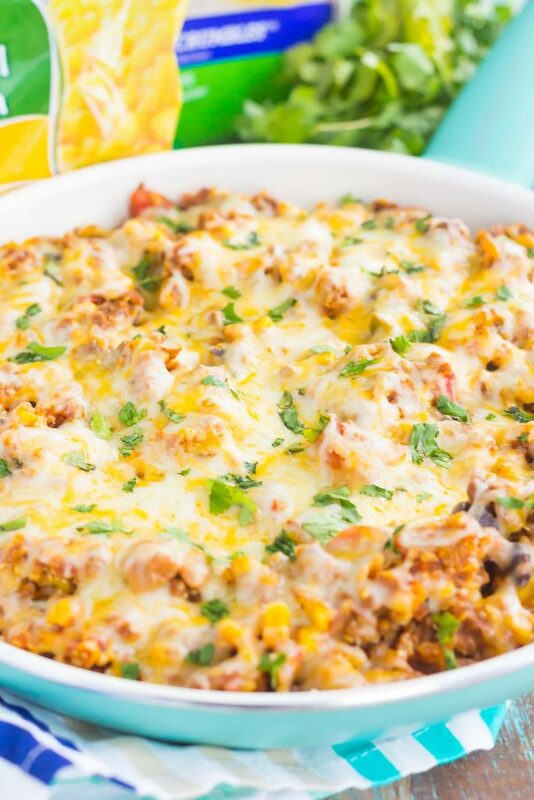 You can definitely use a can of black beans, but I would suggest using ground beef or ground turkey/chicken as well, as that is what the "crumble" part is of the dish. Of course, if you want to leave the meat out, that is fine, too...either way is delicious! I hope you enjoy!